In this Sekiro Novice Guide, we’ll take a deeper look into the game’s mechanics and combat. We’ll give some suggestions and recommendations to players that are not just beginning, but are instead in the middle of their journey, and have a basic understanding of the game. In this guide you will learn many things you may not know, or some things you likely had a concept of, but not a full understanding. If you have not yet checked out our Beginners Guide, I would highly recommend doing so before getting into this video. Combat is such an important part of the game, that we’d be remiss if we didn’t begin there. 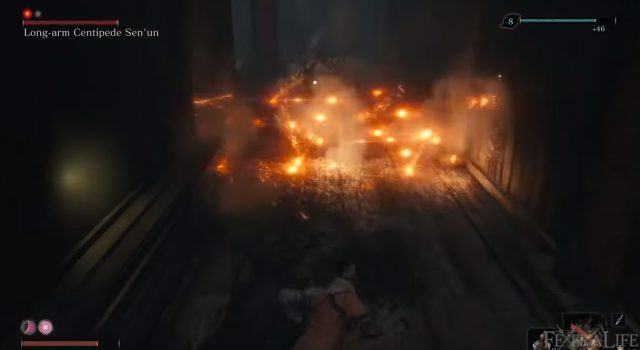 All players share the same or similar struggles in this game, and that is the timing, the rhythm and the general “dance” that is the heart of Sekiro’s gameplay. With that said, the first thing we’ll begin with is Posture. Posture plays a vital role in the combat of Sekiro, so much so in fact that it alone will completely determine the outcome of most battles. Each opponent will take more or less Posture Damage when you attack, depending on what sort of enemies they are. Generally faster more aggressive enemies have less Posture, and so their bars fill faster. Whereas slower larger enemies have tons of Posture, and it’s almost easier to deplete their Vitality instead. In addition, your Attack Power plays an its part as well, increasing the Posture Damage you deal. Generally speaking enemies with lower Posture you want to play more aggressively, prompting a response that you then deflect before attacking again. The strategy for these enemies is to fill their Posture Gauge quickly, almost completely ignoring their Vitality entirely. This strategy works particularly well on Samurai Generals, Lady Butterfly, Genichiro Ashina and any of the Long Shadow Mini-Bosses. 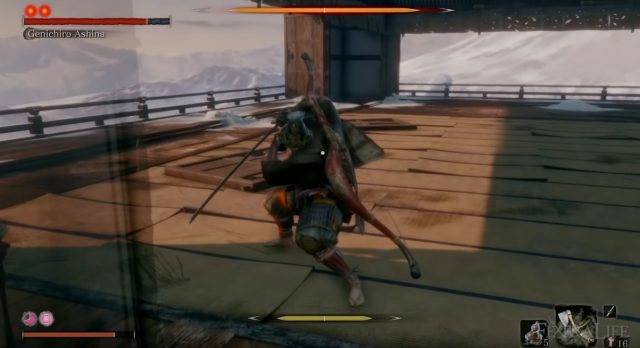 Genichiro Ashina’s Posture builds up much faster than he takes Vitality Damage. An aggressive approach makes this fight easier because of this. Enemies with high Posture, recover it so quickly that you cannot fill their Posture Gauge easily, and in this case you will want to aim to deal Vitality damage first. This will lower their Posture regeneration markedly, making it possible to take them down. Every 25% of Vitality they are missing, the slower it regenerates. 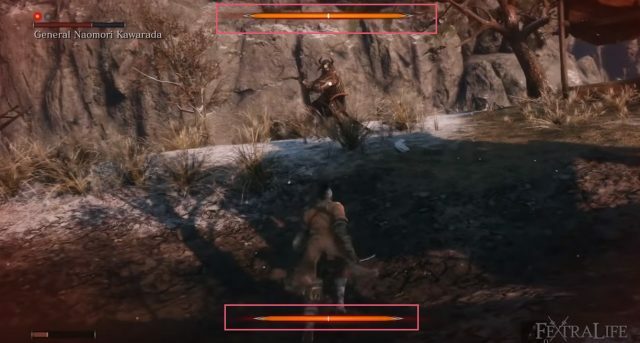 This means you want to aim for these break points when deciding how much Vitality to deal, usually taking these Enemies down to 50% or lower for best results. This works well on Chained Ogres, Juzou the Drunkard, and Corrupted Monk (Illusion). 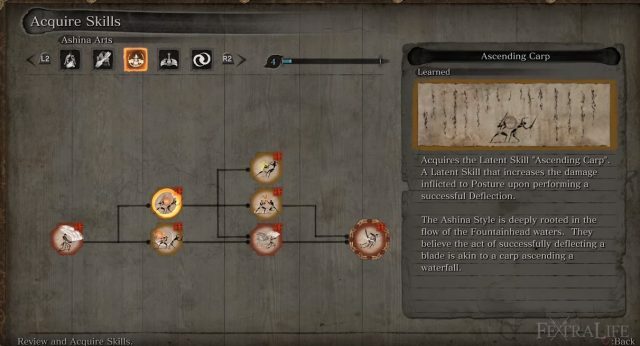 Skills in Sekiro can be confusing at first glance, but they can make your character much more powerful than one would first realize. Players may find that based on the descriptions, there aren’t too many “great” Skills, but this is simply because their value isn’t immediately clear. In this section we’ll take a look at a few Skills all players should have, regardless of playstyle. This Shinobi Martial Art Skill is probably the single most used through out the course of the entire game, and you will have a very bad time if you do not have it. Many Mini-Bosses and Bosses feature “Thrust Attacks” that can be extremely hard to dodge, and this Skill allows you to not only prevent damage, but also deal substantial Posture Damage from simply pressing one button. You’ll want to have this one by the time you reach General Tenzen Yamauchi In Ashina Outskirts or Shinobi Hunter Enshin of Misen in Hirata Estate. You’ll want to gain this Skill early on. 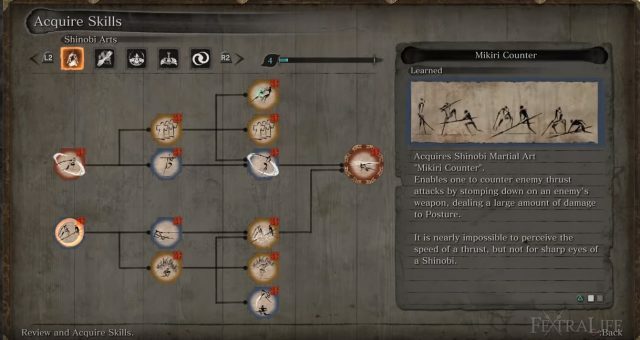 This Shinobi Martial Art Skill will allow you to attack during your Grapple animation when grappling to certain Mini-Bosses and Bosses. It is particularly useful against the Chained Ogre, Gyoubu Oniwa, and the Demon of Hatred. Use it to get in extra damage, when you’d otherwise get none. This Shinobi Martial Arts Skill allows you to follow up a Shuriken throw with an immediate attack that has longer range than a spinning slice. This works particularly well after jumping away from something like a grab attack, where you are out of range of attacking, but the enemy is vulnerable. Use it to punish opponents where you’d otherwise be too far away. These 2 Latent Skills allow you to deal more Posture Damage to enemies you face, and as you might well be aware, that is extremely important. Besides Attack Power, which increases your Posture Damage (as well as your Vitality Damage), these two Latent Skills are one of the ONLY ways to increase your Posture Damage. This makes them invaluable, and must haves for anyone. Both Ascending and Descending Carp are great passive skills that anyone will use. This Latent Skill increases the effectiveness of your Mikiri Counter, making it deal more Posture Damage when successfully executed. Since you will use this ability much more often later on in the game, it isn’t something you need immediately. However, if you’re having trouble with late game Bosses who do “thrust attacks”, this passive skill can really speed things up by filling their Posture Gauge faster. Prosthetic Tools can help ease fights drastically, but none other than the Shinobi Firecracker plays such a vital role. You can initially purchase this from the Crow’s Bed Memorial Mob and you can use it as early as Gyoubu Oniwa in a marked way. The Shinobi Firecracker is the most useful Prosthetic Tool in the game. You’ll want to upgrade this as quickly as possible, getting the Spring -load Firecracker, which does Posture Damage to beasts as well as stuns them. You’ll want to use this on the Guardian Ape, and the ensuing battle vs. it. In addition, you’ll want to get the Purple Fume Spark as quickly as possible because it increases your Posture and Vitality Damage vs. the target for some time. This will allow you to fill Posture Gauges faster against more difficult enemies, speeding up fights, and giving you a smaller window for mistakes. You’ll want to use this against some of the end game bosses to interrupt some of their more powerful attacks. After defeating the boss in the Senpou Temple area you will receive the Puppeteer Ninjutsu that will allow you to take control of enemies for a brief period of time upon a successful Backstab Deathblow. There are many Mini-Boss fights that can be made easier by using this Ninjutsu on an enemy and then facing said Mini-Boss. 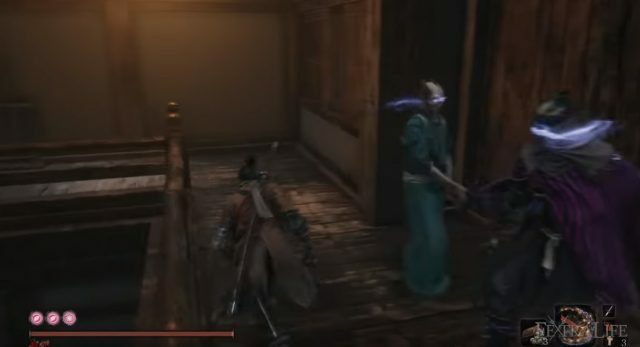 For example the Long Shadow Vilehand has another enemy in the room with him that you can use this on, to give you 30 seconds or so of a 2 on 1. Use this to your advantage whenever possible, making many difficult fights easier, and remember you can have it working on multiple enemies at once. Build an army if you need to, but use this Ninjutsu to make areas with many enemies easier. Stay tuned as we have a Skills Guide and Build Guide coming soon, along with our Expert Guide. Be sure to drop by our Twitch and see us live in action for some fun and deaths!